I think the raccoon may have arrived about a week and a half ago but I didn’t immediately realize it. My first clue was that I found dirt in my ground birdbaths a few times as if someone was washing in them. Then one morning last week, I came outside to find that one of the suet feeders that hangs on a tree branch had fallen down. I thought, “Oh, that’s odd. I didn’t think it was windy last night.” I replaced the missing suet block and re-hung the feeder. Then the morning after that, I found the cage nut block feeder, still attached to its baffle on the ground. That is when I realized that something was deliberately going after the feeders. The attack on the nut block wasn’t successful really, because it landed hard on the ground, feeder-side-down with the baffle on top. The hook attaching the baffle to the top side of the cage feeder was driven all the way through the nut block and hooked on the opposite (bottom) side of the cage feeder so the galvanized metal baffle was very firmly attached to it. (I’ve left it that way as you can see in the above picture.) I don’t think the critter was able to flip the baffle-topped feeder over to get into it as the nut block was still inside the feeder. As all of this was happening during the night, I suspected a raccoon but I took some reassurance that the first suet feeder hadn’t been attacked again. I hoped that the raccoon didn’t like the hot pepper suet and wasn’t able to get to the nut block and so would stop. Not so. The raccoon then moved on to the suet feeders hanging in low bushes in front of the house outside our bedroom windows. I’m actually surprised she didn’t start there to begin with because they are definitely the most accessible. This time, the raccoon had a new strategy. Apparently not liking the taste of the hot pepper, she tried washing the suet block in the birdbath that sits just a foot from the cage suet feeder she raided. 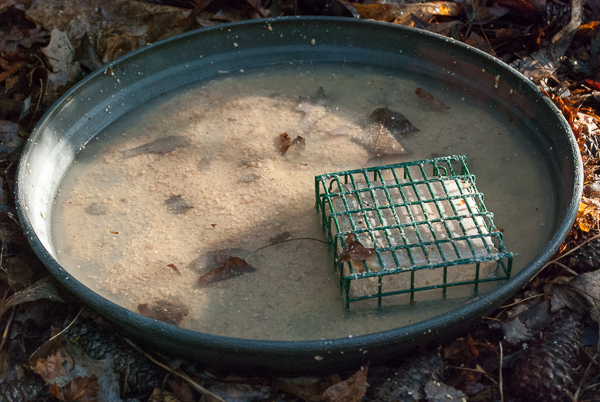 I found the birdbath full of dissolved suet the next morning. 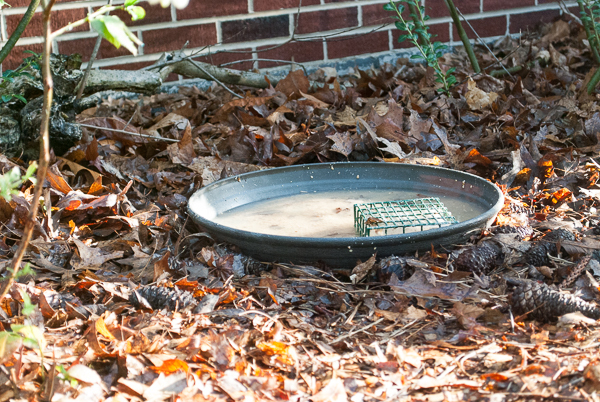 Because there was so much suet left in the bath, I had hope that her washing experiment didn’t work, but alas, I found suet in the birdbath again the next morning and the two suet blocks there both missing large gouges of suet, so I knew that I needed to take some action. I had spent a several hours over the past few days researching raccoon problems on the internet. 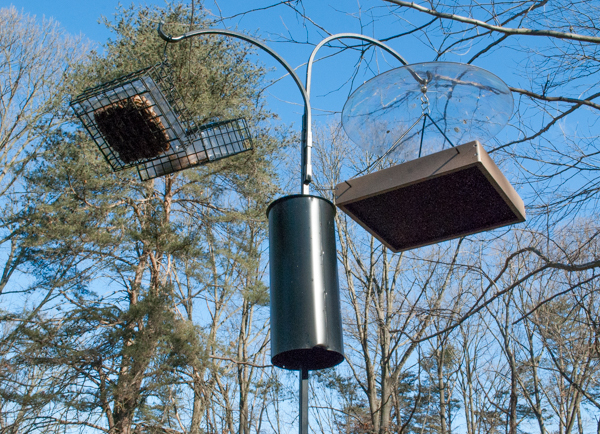 I decided that I would try putting my suet feeders on poles protected with raccoon baffles. So I set out in yesterday morning’s spring rain to go to my local bird feeding store, Mother Natures in Columbia Maryland. I have read that raccoons will usually go for whatever food is easiest to obtain. Right now, my suet has been the least protected from furry critters of all my feeders, but I’m taking care of that with the new poles and baffles. My worry is that if I succeed in getting them out of the suet, that the raccoon will move on to my other feeders, something that she hasn’t seemed to have gotten into so far. She thought that the same was likely true (but again no guarantee) for the EVRA galvanized disk baffles that I’m using on all my hanging feeders except the nyjer feeders. Hopefully they will be enough to keep the raccoon out of them as well. Up until the arrival of the raccoon, I had six feeders with suet and one more with a nut block. 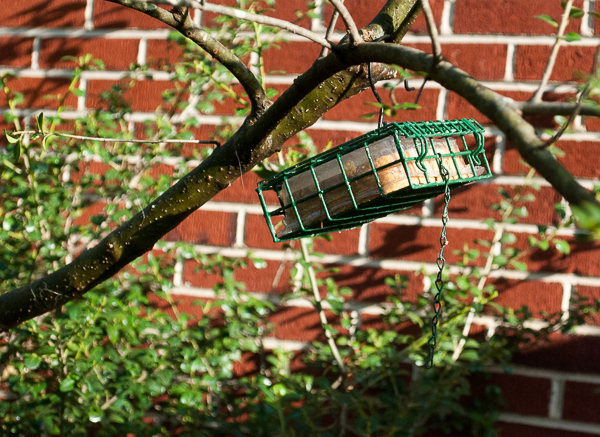 Two of the suet feeders are the simple traditional cage feeders. The remaining four suet feeders are the Birds Choice hanging upside down suet feeders that look like little tan and green houses. The nut block feeder is a much larger and heavier cage type feeder that holds an extra large nut block. My plan is to put the two smaller suet cage feeders away for now. 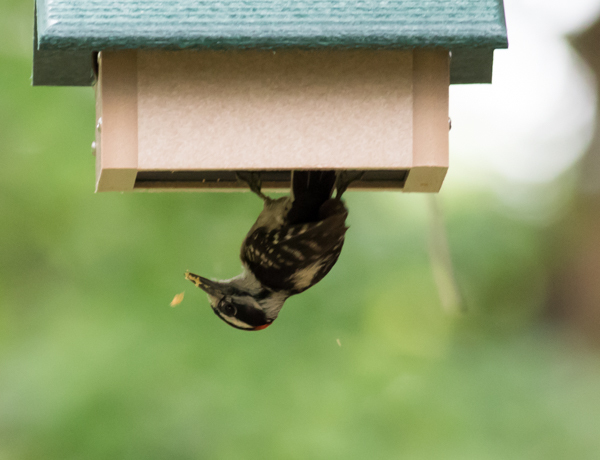 Quite a few types of birds enjoy suet, especially in the spring when they have young to feed. In particular, I have a pair of Downey Woodpeckers in the front yard and another pair in the back. I’ve noticed that if the suet runs out on one side of the yard, the woodpeckers from that side will come to the other side and they’ll fight and chase each other around. So I’m putting one pole feeder up in the front yard, close to the living room window with two of the Birds Choice feeders and another pole feeder up in the back yard with one Birds Choice feeder and the large nut block feeder. Michelle assured me that raccoons are not as acrobatic as squirrels and that while they can climb and reach out to get access to a feeder, they don’t leap from branches and other spots the way a squirrel will. So I need to position the poles far enough away from anything that the raccoon can get onto so that it can’t reach out to the feeder. Squirrels can jump up to eight feet though, so I’ll be putting the feeders away from any branches or surfaces within squirrel jumping range where possible. 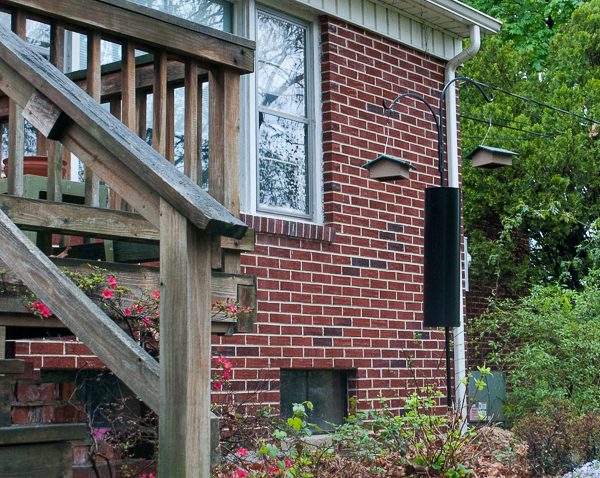 To cut down on bird window strikes, the guidance is to place feeders either within three feet of a window so they can’t get up to fatal speed if they get startled and hit the window, or farther out than thirty feet from the window. There really isn’t a good place for a pole near where the suet feeders out front have been located. So I’m trying the pole further over in the front fairly close to the front living room window instead. It is just slightly farther than three feet out from the window, but there is a sidewalk that constrains where I can put it, so I’m hoping it will be ok. One feeder is actually within jumping distance for a squirrel but they mostly stay out of the hot pepper suet and these particular feeders were not protected from squirrels before, so I’m not going to worry about that now. So far, the pole and feeders have been in their new spot for about twenty-four hours. I haven’t seen a bird try it out yet, but sometimes it can take a while for birds to get comfortable with a new feeder location so I have hope that they’ll adjust to the new spot. The pole in the backyard will probably go just inside my herb garden or maybe my island flower garden further out in the yard if the herb garden location near several existing feeders proves to be too busy a location for the woodpeckers. I’m waiting on a second raccoon baffle to arrive at the store to set that pole feeder system up. The final Birds Choice suet feeder will stay hanging on far end of the branch where it is for now, as the raccoon hasn’t bothered it yet. If it does, I may look into adding an extra third arm to the new pole for that. 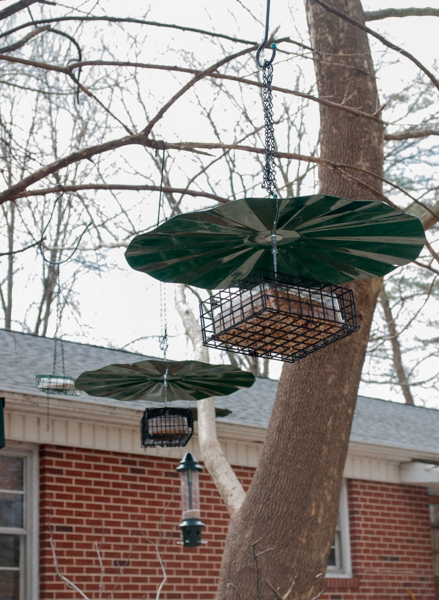 Once these suet feeders and the nut block are up on the pole, the Erva disk baffles will no longer be necessary for them. I’m playing with the idea of putting those two baffles over two of the four nyjer feeders at the end of the house. 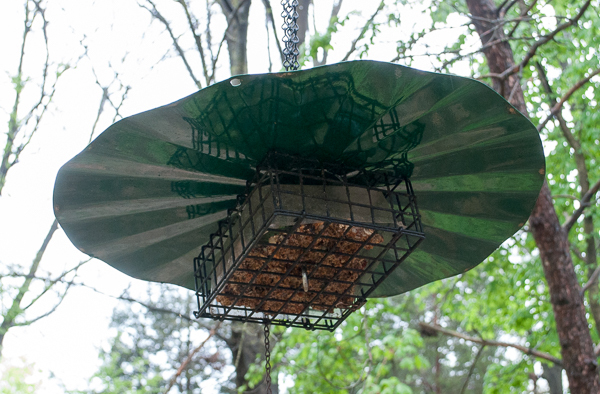 Squirrels have never taken any interest in the nyjer seed and I have no idea whether nyjer seed would appeal to a raccoon, but if nothing else, the baffles would serve as a rain guard and the goldfinches might appreciate that addition. We’ll see. So for now, that’s my plan. Hopefully that will be enough. 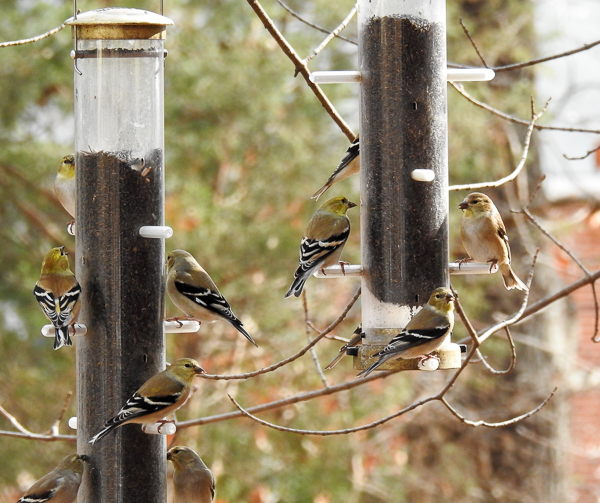 The good news is that last night there was no attack on any of the feeders so we are off to a good start. But raccoons have a reputation for being pretty unstoppable, so I won’t be surprised to find that my challenge has just begun. I’ll let you know how my struggle goes as time moves along! 4/21/17 Update: Three days later and there have been no more attacks on any of the feeders. So far so good! I am still seeing dirt in one of the ground birdbaths, but that turned out to be an American Robin who seems to be building a nest nearby and using the water to soak long grasses and maybe to make a bit of mud. 5/3/17 Update: The suet feeders on the two poles remain unmolested. The last suet feeder I left on the branch came down and I found the suet in the back birdbath yesterday morning. So I got an extra arm for the backyard pole and moved it over to the pole. 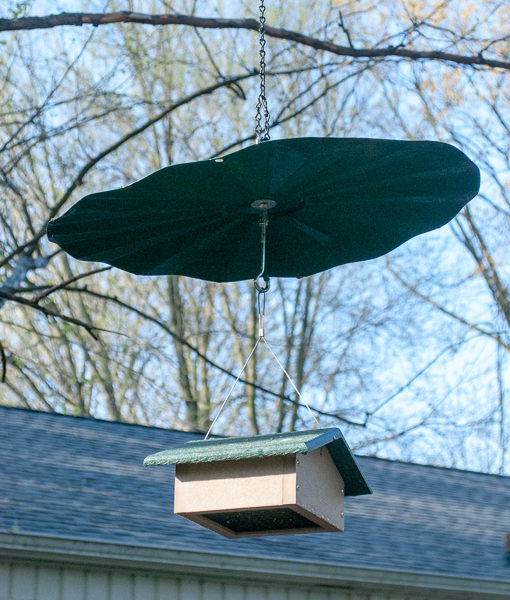 So far, it looks like putting them on poles is the solution to keeping both squirrels and raccoons out . . . at least in my yard. I’m somewhat of a noon to birdfeeding, but so far just this year, I’ve had to deal with squirrels, raccoons, and hawks. And I’ve found the squirrels to be the most “aggressive” when it comes to working to get to the grub ….one thing I noticed, in your very last photo, is that your feeder pole is very close to the house….. I learned my lesson with jumping squirrels that I cannot keep the Shepards hook too close to thr house, because the squirrels climb the hkuse, and then just jump into the feeder …kinda like Circ de’ solei swinging to and fro….lol even with the baffles on the poles, I’m guessing they can still get the goods by climbing the house and hopping on over to the feeder itself. Try moving your pole over a cpl of feet and see if that makes any difference. Hi Kristeen, I agree. Squirrels can be relentless when it comes to trying to get into feeders. But between putting feeders on baffled poles, using Squirrel Buster Plus feeders when hanging in one them in trees and using the hot pepper type of suet, the squirrels pretty much leave my feeders alone these days. It’s all about the feeders you get, the food you put in it and the placement. While the pole feeder near the front window is definitely within jumping distance for a squirrel, the only thing in those feeders is the hot pepper suet which they don’t like so they haven’t bothered it at all. The only time they’ll eat the hot pepper suet is in the winter when they are so hungry that they’ll eat about anything and I put sunflower in a special feeder for them in the backyard that keeps them happy then and off the suet. So far putting the suet on poles with raccoon baffles has stopped that problem. Raccoons apparently aren’t jumpers like squirrels so even though the pole is close to the house, they can’t reach it. And being close to the window is safer for the birds, cutting down window collisions. I haven’t had too many problems with squirrels yet but I know it’s just a matter of time. The raccoons were a real problem last summer until I added raccoon baffles to my poles and brought in some feeders at night. I haven’t seen evidence of a raccoon in months but I’m betting they return this spring. It’s such a battle! When I grumble about our regular squirrels, I remind myself that at least they aren’t raccoons. I think I got off lucky this time. We use Have a Heart Raccoon traps and relocate them to a woods nearby. Cat food as bait. I enjoy the squirrels, their acrobatics are very entertaining. They compete with blue jays for peanuts. Black oil sunflower seeds for everyone else.